Focusing on the national program of Community Service, Jim Ned FCCLA’s annual Day of Service was held on Friday, November 16. They visited Meek Children's Hospital, Day Nursery of Abilene and helped out at Mission Thanksgiving (a local collection of food and clothing held by Love and Care Ministries in Abilene). They collected new small stuffed animals for the children who come to the hospital during the year. Forty-six animals were collected from students and staff. When they delivered the collection, they also received a tour of the unit led by the child life specialist. She shared with them about her job and the care the children receive while in the hospital. Her job consists of helping the children be comfortable and understand everything that is going on while they are there. 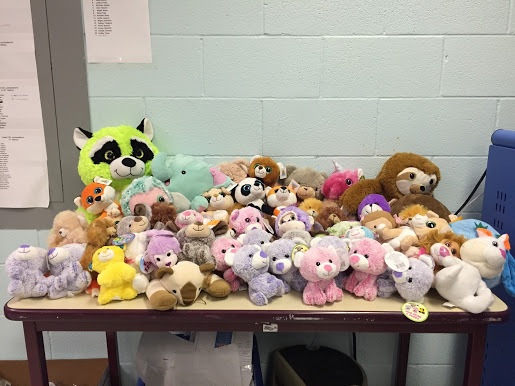 At least 46 children will receive something cuddly during their hospital visit. Three hundred fifty students and staff at the high school heard about the event and had an opportunity to participate. Mrs. Watson offered a party to her class who brought the most by percentage.